Choosing York means choosing from one of our two dynamic campuses with modern facilities and a multicultural environment. We offer you a first-class education, tailored student services, financial assistance and an unparalleled support system. We offer community and an opportunity to connect with your academic peers. Above all, we're here to help you realize your career and life goals. York University offers bursaries, scholarships and awards for transfer students, as well as awards by faculty and an Undergraduate Entrance Bursary. More than 1,900 on-campus employment opportunities are also available to our students. If you are looking for additional resources to help fund your university education, the Ontario Student Assistance Program (OSAP) is available to transfer students. Start your career before you graduate. Take advantage of internships, both at home and abroad, leadership training and experiential learning opportunities - the means for you to apply your newly learned theoretical skills to a real-world situation in the classroom, community or workplace environment. York's Career Centre offers an exciting range of programs, services and events to help you get a head start on your career. Learn about career opportunities, get support in your job search, explore further education and connect with professionals during special events. After you graduate, you can access supports and resources at the Career Centre for up to two years. 10,000+ full-time, part-time, internship, summer and on-campus employment opportunities. 500+ professionals (employers, educators and alumni) that visited campus to connect with York students during industry-specific panel discussions, recruitment sessions, career fairs and other activities. 320+ workshops on the topics of career exploration, job search, professional etiquette and further education. You may have work, family, school and other priorities to balance. 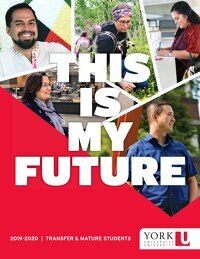 York offers flexible options for studying that recognize that your pathway through university, and to your career, will be unique. All of our undergraduate programs are available for full-time study and most are offered on a part-time basis. While most programs are designed for day-time study, the Faculty of Liberal Arts & Professional Studies also offers courses in the afternoon and evening. We also offer select weekend classes. Explore our course selection site to get an idea of your options. The number of courses you enrol in each year will determine your full-time or part-time status, giving you the option of paying by the course. The Faculty of Liberal Arts & Professional Studies, the Faculties of Health, Science and Glendon provide you with the opportunity to explore various subjects via eLearning. Choose from two type of courses: Fully Online Courses (ONLN) or Blended Courses (BLEN) which combine in-class and online course delivery. This is a great option for students with a long commute to campus. York offers a number of supports to ensure your academic success including: peer tutors, peer mentors, writing centres, academic advising, Students Papers & Academic Research Kit (SPARK) and accessibility services. York University's five libraries give you a world of knowledge at your fingertips. Gain access to more than 600,000 e-books, 72,000 full-text e-journals and 2.6 million printed volumes, quiet and collaborative study spaces and specialized workshops offered by the Learning Commons. Take advantage of research assistance services including the online chat tool Ask a Librarian, the online FAQ system, LibANSWERS, In-Person Assistance, Email and Telephone Help. Counselling & Disability Services (CDS) offers resources to help you excel at York. CDS helps students with learning, mental health, physical, medical or sensory disabilities and helps arrange academic accommodations. Personal counselling and learning and study skills services are open to all students. Download the Disability Services App to quickly and easily access resource and service information. York directly supports mature and part-time students with their transition to York and their continued success during their studies. ACMAPS is a pan-university home for mature and part-time students. ACMAPS offers advising, orientations, success workshops, parent support groups and a peer mentor program to help students transition to and navigate university life. YUMSO offers a social outlet for mature students. Student volunteers guide mature students through university starting with orientation and continuing with social events throughout the year. The YUMSO office acts as a student hub to study, relax and chat. Choose from more than 400 student clubs, 13 student newspapers, 36 student governing groups and more than 1,000 student-run events per year on campus. Enrich your time at York by joining clubs, associations and organizations that will help you develop your career, explore networking opportunities and establish professional and social connections. Check out the YU CONNECT bulletin board for social and professional opportunities and track your on-campus work and volunteer activity using York's Co-Curricular Record.